It was because of that blog that I got to know today’s guest, Véronique Martin-Place, since she, too, was quite active in the expat blogging world. And when I found out she was a Frenchwoman living in Chicago, I was intrigued. What did she make of the city of broad shoulders, jazz, and deep-dish pizza? I asked her this and a host of other questions in an interview for my blog. For starters, she said that she and her family — her husband is a French diplomat and they have two young daughters — were gradually finding their feet in Chicago. (She did not, however, mention she was planning to write a book of that title!) She didn’t entirely approve of America’s throw-away society and still cooked every day for her family — she even offered her recipe for “real” vinaigrette in the comments. She also reported she’d seen plenty of elephants while living in Sri Lanka (her husband’s second assignment, after Norway). Bonjour, Véronique! When we last spoke, toward the end of 2010, you told me you’d arrived in Chicago with hopes of getting a job, but then the recession hit, so you’d started up your own writing business. 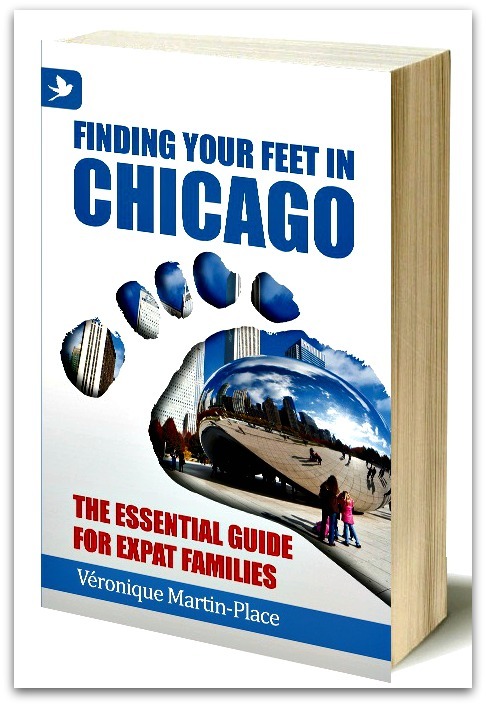 When did you hatch the plan to write a book for expats in the Windy City? I was already thinking about it when we connected. After witnessing several incidences of culture shock at my daughters’ school, I realized I wasn’t alone in having troubles. Several families from different parts of the world had moved to Chicago around the same time. All of us were in need of information and advice. Meanwhile, I’d started up my blog, Expat Forever, to share my experiences about Chicago — tips on where to settle, which schools to choose, etc. I looked around for local guidebooks to recommend — but there was nothing. So I decided to write one myself. That reminds me of the famous quote by Toni Morrison: “If there’s a book that you want to read, but it hasn’t been written yet, then you must write it.” How long did it take you to produce the book? From the idea to holding the book in my hands, it took one year and a half! Writing the book directly in English was difficult at the beginning, since English is not my native language. But after a while, I got used to it. Besides writing in English, what was the most challenging part of the process? Editing the manuscript. I decided to hire an editor to help with the task. I know from our previous conversation that having fresh, healthy food is important to you — after all, that’s part of being French! I also seem to recall that you were not a fan of Chicago pizza. You said it was too heavy. But did you cover it in your book? Of course! I have a chapter dedicated to “Having fun in Chicago,” which includes a section on family-friendly dining out. Before giving my top 10 Chicago child-friendly restaurants, I explain what the Chicago specialties are and insist that children (and their parents) MUST try them. That includes Chicago-style pizza and Chicago-style hot dogs. What has been the response thus far? Rather good, I think. I’ve gotten only five-stars comments on Amazon! Which sections are the most popular? Readers say they like having so much practical information on family-related topics — not just the advice itself, but all the personal anecdotes and testimonials I include from expat parents. I talked to lots of them and wrote up their stories as “blog posts” or interviews. The stories really speak to the kinds of anxieties most expats have — and they make the book an easy, fun read. And now your husband has moved on to a diplomatic post in Shanghai! Tell me, does ANYTHING about China remind you of the United States, or are these two countries poles apart? The United States and China are definitely different cultures — but one similarity struck me right away. Both are consumerist societies. In the US, everything is done to make you purchase and there are plenty of opportunities for you to part with your money. Here in Shanghai, it seems that the only occupation is “shopping.” It’s the only activity people urge you to do from the moment you arrive — visit malls, markets, supermarkets and so on. And I can tell you they have tons of malls, tons of markets (from traditional, the kinds that sell crickets and flowers, to modern, selling electronics, furniture, shoes, and so on), and many, many supermarkets. How did you prepare yourself and your two daughters for the move? We didn’t have the chance to make a look-see visit. But six months before moving to Chicago, I’d gone to Shanghai on business, so I had a picture of what to expect: a very urbanized and polluted city. That is also why we decided to settle in the new and “green” development area of Shanghai that is called Pudong. Did your daughters have any idea of the change they were in for? My husband and I found some videos about the city on the Internet for them to watch. Fortunately, they’d studied some Mandarin at their American elementary school, so already knew a lot about Chinese traditions and stories. To be honest, I think we learned as much from them about cultural matters as they learned from us on the practical aspects. It was real team work! I know it’s still early days, but what have you enjoyed the most about living in Shanghai? Perhaps surprisingly, the fact I can bike! In Pudong, there are a lot of protected biking trails, so it allows me to discover independently this part of the city, and it’s much faster than by foot. But I don’t bike in Puxi (the other side of the Huangpu River, which divides the city into two regions: Pudong, where I live, and Puxi, the city’s historic center). It’s too dangerous. What is the feature you enjoy the least? Shanghai is extremely urbanized and I miss greenery. Also, it is very polluted, though less so than Beijing. What is the top piece of advice you’d give to anyone thinking of becoming an expat in that part of the world — particularly a trailing spouse? 2) Get involved in your local community. 3) Keep doing your (or start new) hobbies and/or sports. 4) Discover your surroundings little by little, and you’ll eventually come to know the city as well as the content of your pocket. 5) If you are an accompanying spouse and cannot work locally, go back to school and get new skills, or volunteer to do something you can use professionally upon returning home for good. And now I have to ask you the obvious question: any plans to write Finding Your Feet in Shanghai? Many people have indeed asked me that question. And I must admit, the idea was in the back of my mind when I first started my book for expats in Chicago. I thought to myself, this can be the first in a collection, and the next one will be about the city where my husband gets posted next. But at least at this point, I don’t think I’ll write an expat guide to Shanghai. One reason is that there are already lots of books, magazines as well as Web sites for expats in this city. There isn’t the same need as there was in Chicago. But another reason is that my time here is so limited. My husband’s post is for just three years. I’d have to spend all of my time doing research and interviews, getting to know the city like my pocket. And that’s before I can start writing. My book on Chicago was released a couple of weeks after I left to fly to Shanghai — which didn’t give me any time for promoting it locally. I found that very frustrating and wouldn’t want to repeat the experience. Books these days have to be promoted like crazy, and although you can do a lot of it online, I don’t think online promotions can replace interacting with readers in person. But surely you’ll write another book? I may not write another book for expat families living in Shanghai, but I already know I will write another book about expatriation. Actually, I have already started it. But I cannot say much more. It is too early. 1. Last truly great book you read: Rien Ne S’oppose a la Nuit (Nothing Holds Back the Night), by Delphine de Vigan. 2. Favorite literary genre: Memoirs — but also novels, illustrated books like the ones of Danny Gregory (I love his writings and drawings), and carnets de voyage (travel journals). And I have to confess that I still read a lot of children books, especially picture books. My dream is to write and illustrate one. 3. Reading habits on a plane: Something fun and easy to read on my Kindle! I travel light. 4. The one book you’d require the president of France to read, and why: My book, of course! I’m joking. I would like him to read Les mots pour le dire (The Words to Say It), by Marie Cardinal. Everyone should read it. 5. Favorite books as a child: Astérix and Obélix comic book stories, by René Goscinny (illustrated by Albert Uderzo) and Le Petit Prince (The Little Prince), by Antoine de Saint Exupéry. 7. The writer, alive or dead, you’d most like to meet: There are several — all alive and all women: Robin Pascoe, the author of four books about expatriation; Anne Lamott; Annie Ernaux; and the aforementioned Delphine De Vigan. 8. Your reading habits: Every evening, at least one hour, and Sundays as much as I can. 10. The book you plan to read next: The Help (but I got the French translation), by Kathryn Stockett. Wow, what a stimulating list! Readers, any questions or comments for Véronique while we have her attention? Ce qu’est une femme extraordinaire — I think you’ll agree! 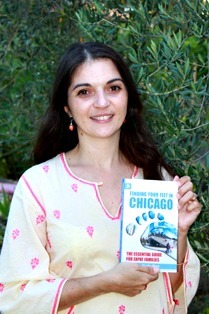 Images: Véronique Martin-Place with her Chicago book; the book cover in 3D (author’s own photos).